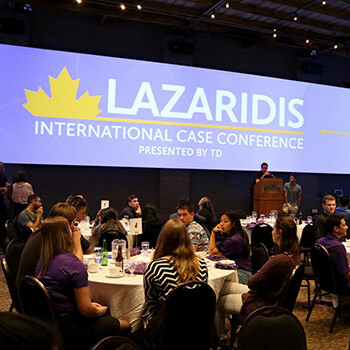 It is a big week for Wilfrid Laurier University’s Lazaridis School of Business and Economics as they are in the midst of hosting their inaugural international case competition Oct. 7-13. Nine teams from five countries are competing to solve real-world business problems known as “live cases” in which teams are presented with a problem and asked to research, analyze and present creative and strategic recommendations for the business under immense time constraint. With title sponsor TD Bank, the competition pits top academic teams from China, Mexico, the US, Hungary and Canada against one another in an intense exercise in applying business theories and concepts to current organizational issues. One of the cases is an intensive five-hour sprint, and the second is a 24-hour problem-solving marathon. The first of its kind in the area, the Lazaridis School of Business International Case Competition introduces and showcases Waterloo Region’s attractions to visitors from around the world. From its unique technology eco-system to the exuberant community life celebrated by Oktoberfest, the region’s bountiful resources add excitement to an already thrilling event. For more information, please visit the conference website at lazicc.com.